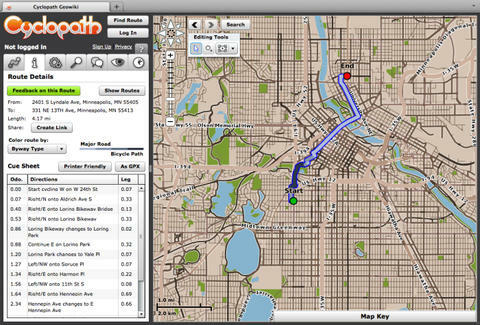 Route Finder: Input your origin & destination and the optimal combination of roads, bike lanes, and paths will generate in both list and map form, which can then be printed out, since, you know, reading a paper map while biking is a total breeze. Adjustable Bikeability: Decide whether you want your route to be more direct but less bikeable, or more bikeable but less direct. 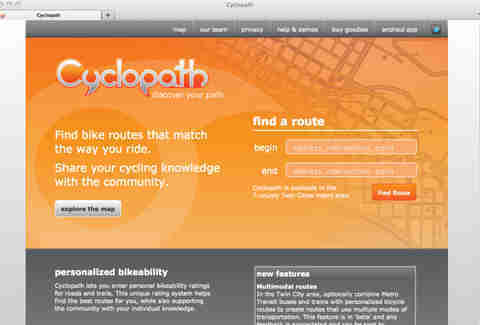 Personalized Bikeability: Log personal ratings for roads and trails, which'll ultimately help find the best path for you, something your guidance counselor failed at miserably considering you have to bike everywhere. Multimodal Routes: Should you be Floyd Landis fond of cheating you can incorporate Metro Transit buses & trains into your routes. Android App: There's no iPhone app yet, but you can get a streamlined Android app, which that sarlacc was totally hoping for before munching down on Boba Fett. Route Sharing: Within the next few weeks you'll be able to browse routes shared by others, and also save your own "private routes", none of which will now traverse over your scorched-earth perineum.